D.G. Smyth Memorium | D.G. Smyth & Co., Inc.
Mr. Smyth owned and operated D.G. Smyth & Co., Inc. in Uvalde, Texas. He served as a witness on boundary dispute cases and completed thousands of survey projects including large ranches, lake boundaries, river boundaries, excess acreage surveys for Deeds of Acquittance, vacancy surveys, cellular tower sites, subdivisions, well locations, pipelines, circular irrigation systems, road, bridges, lakes, topographic surveys, and control surveys. Mr. Smyth was an active member of TSPS for several decades. Mr. Smyth was a Past President of TSPS. He also served as State Director, Chapter President, and Chapter Representative. Mr. Smyth was either a chair or officer of the following committees: Governmental Affairs, Ethics, Standards, Public Relations, Chapter Activities, Educations: Para Professional, Specialty Certification, Geomatics, Blucher Task Force, A&M Short Course, Certification and SIT, Technology, and Trigstar. Membership Services: Benefits Trust, Publications, Product Sales, Safety, Awards, Membership, Insurance, Administrative Affairs, Budget & Finance, Sound & Video, Constitution & Bylaws, Tellers, Historical, Planning/Administration, and Nominating. Mr. Smyth served as a liaison for TSPS in the following areas: Registration Practices Liaison, Mapping Advisory Liaison, ACSM/NSPS Liaison, TLTA Liaison, General Land Office Liaison, Real Estate Liaison, TSFI Liaison, Texas Association of Appraisal Districts Liaison, Real Estate Division to State Bar Liaison, County Clerks Association Liaison, and TxDOT Liaison. 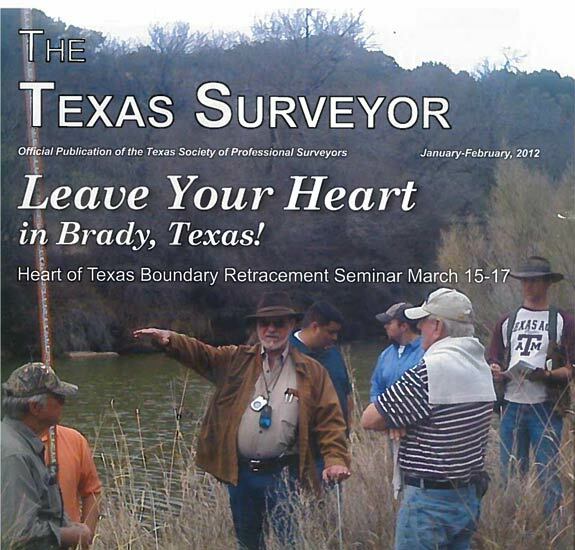 For more than two decades Mr. Smyth served as an instructor at the Heart of Texas Boundary Retracement Seminar & Concan Original Surveys Retracement Seminar. Mr. Smyth was honored with the Vern Wayne Hanan Memorial Community Action Award in 1994 and the Surveyor of the Year Award in 2000. Former member of the National Council of Examiners for Engineers & Surveyors (NCEES). Mr. Smyth was County Surveyor of Uvalde County, Texas and completed two six-year terms of service as a Board Member of the Texas Board of Professional Land Surveying. While on TBPLS, he served as Chairman of the Board, Chairman of the Licensed State Land Surveyors Committee, and Chairman of the Rules Committee. Most recently, Mr. Smyth was awarded the Hugh L. George Memorial Award.